We report Au/Ag bimetallic nanocomposites as a highly sensitive plasmonic material. A unit approach via a three-dimensional numerical modeling is introduced to observe collective plasmon resonance in Au/Ag bimetallic nanocomposites as well as Au mono-metallic nanoensembles. Au nanoensembles provide consistently identical plasmon wavelength, independent of inter-unit distance. 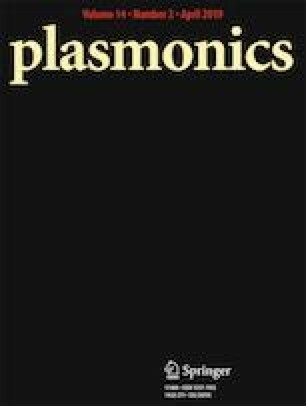 In analogy with mono-metallic nanoensembles, Au/Ag bimetallic nanocomposites distinctly feature converging dual plasmon resonance peaks to a single plasmon resonance peak, strongly depending on the packing density and the unit size. An effective unit size of bimetallic nanocomposites is below 2.5 nm in a subwavelength structure, which is small enough to feature bimetallic nanocomposites. As a result, the Au/Ag bimetallic nanocomposites clearly show exceptionally high sensitivity and figure-of-merit (approximately 3-fold of conventional plasmon sensitivity and 4.3-fold of conventional plasmon FOM), resulting from coupled Au-Ag quadrupole bimetallic nanounits. This study provides essential rationales for Au/Ag bimetallic nanocomposites serving as a desirable and alternative plasmonic material for advanced nanoplasmonic-sensing technologies. This work was supported by Samsung Research Funding Center of Samsung Electronics under Project Number SRFC-IT1402-51 and National Research Foundation of Korea (NRF) Ministry of Science, ICT and Future Planning under Project Number 2018029899.